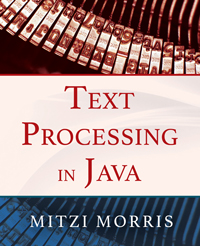 I’m pleased to announce the publication of Text Processing in Java ! This book teaches you how to master the subtle art of multilingual text processing and prevent text data corruption. Data corruption is the all-too-common problem of words that are garbled into strings of question marks, black diamonds, or random glyphs. In Japanese this is called mojibake (“character change”), written 文字化け, but on your browser it might look like this: ����� or this: æ–‡å­—åŒ–ã‘. When this happens, pinpointing the source of error can be surprisingly difficult and time-consuming. The information and example programs in this book make it easy. This book also provides an introduction to natural language processing using Lucene and Solr. It covers the tools and techniques necessary for managing large collections of text data, whether they come from news feeds, databases, or legacy documents. Each chapter contains executable programs that can also be used for text data forensics. Other books on text processing presuppose much of the material covered in this book. They gloss over the details of transforming text from one format to another and assume perfect input data. The messy reality of raw text will have you reaching for this book again and again. This entry was posted on January 31, 2014 at 4:42 am and is filed under Java, Lucene, Mitzi's Blog. You can follow any responses to this entry through the RSS 2.0 feed. You can leave a response, or trackback from your own site. Congratulations! This will get used widely. Will they be doing editions on other languages? In the words of the late, great Marcel Marceau, Non! Whoops, that’s “in other languages”. Is the ebook available in a non-Kindle (or non DRMed) version? The Kindle version is not DRMed. That’s the only ebook version available. Thank you for writing T.P. in J.
I invented a new logic for sorting and translating individual phrases into a 5 -tuple matrix. Image all sentence falling neatly under a five column sortable table..which part of Java would help best with this?